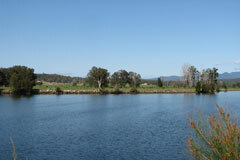 Located on the NSW south coast, the Moruya catchment covers an area of 1,550 square kilometres. View real-time data from the Moruya catchment on this website. Eurobodalla Shire Council pumps water from the Deua River to supply the town of Moruya. Water pumped from the Deua River can be stored in Deep Creek Dam, located in the Clyde River Basin. Eurobodalla Shire Council, tourism, forestry, cattle grazing and dairy farming. Most of the rivers and creeks in the Moruya River Basin are unregulated, with no major storages to capture and control flows. Most water users rely on natural flows or small structures, such as weirs for their water supplies. As in most unregulated rivers, flows are mostly affected during relatively dry times, when water is low and demand is high. The management of lands along river and creek banks is an important issue that can affect water flow and quality. For example, cattle grazing can damage sensitive riverbank vegetation resulting in erosion. Also, development along the coastal fringe can alter natural waterways and increase water pollution. To preserve water resources in river and groundwater systems for the long term it is critical to balance the competing needs of the environment and water users. Water sharing plans establish rules for sharing water between the environmental needs of the river or aquifer and water users, and also between different types of water use such as town supply, rural domestic supply, stock watering, industry and irrigation. Water sharing plans to cover all catchments in NSW are progressively being developed in consultation with stakeholders and the community.